Finding the best GPS device for your car used to be a tricky ordeal even if you narrowed the selection to a certain brand. Now, it is a little bit simpler, especially if you are looking to get a Garmin nuvi product. Garmin’s Essential Line of GPS devices for 2015 are the company’s strongest showing yet and you could get almost any of these models for under $200. This means that you can expect a lot more premium functionality if you go for anything more expensive. The Garmin nuvi 2599LMT is currently the most expensive Garmin GPS device of the company’s Advanced series and it is most ideal for people frequently on the road and need to reach destinations in a timely manner. Like all Garmin products in the 2014 Advanced series, the Garmin nuvi 2599LMTHD has a lightweight feel with a premium touch. The 5-inch 480×272 resolution display may not sound very impressive but display itself is capacitive and made of glass. This allows multi-touch support and makes the screen a lot more responsive to touches in general. All Garmin nuvi devices with the LMT suffix get the lifetime maps and traffic avoidance benefits but the Garmin nuvi 2599LMT is a special case aiming to be the best traffic companion it can possibly be. The nuvi 2599LMT comes with a feature called HD Digital Traffic that expands the typical traffic coverage to major highways, interstates and other secondary roads. The feature continuously runs in the background always scanning for possible traffic concerns. An alert will appear on the side of the screen so you can easily take note while still being able to pay attention to your map. You can call up the HD Digital Traffic feature any time by means of voice command and the Garmin nuvi 2599LMT will respond right back. The nuvi 2599LMT does an excellent job in coming up with quick detours if rerouting is necessary. You can even get prompts if you are not taking the fastest route. Like the standard traffic features, you can use HD Digital Traffic as long as you like with no subscriptions to renew. It also doesn’t depend on a smartphone for getting the weather. Calling up the HD Digital Traffic with your voice is just one of the many voice commands available. With the Voice Control app, you can train the Garmin nuvi 2599LMT to recognize your voice and then proceed to issuing commands to the device in a natural manner. It even recognizes some popular locations so you can expect to plan a route very quickly whenever you need your coffee fix by saying “Starbucks”. Not everyone uses the voice assistant on their smartphones but the voice-activated navigation on the nuvi 2599LMT helps in a huge way as you can plan routes while having both hands on the steering wheel. 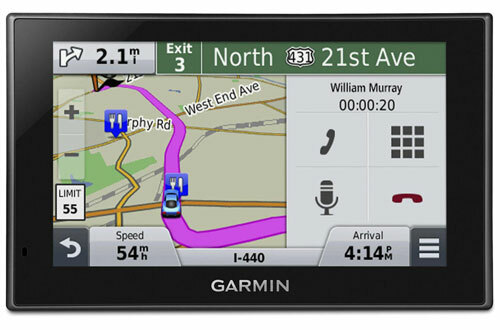 Your own smartphone can serve as an alternate means to plan a route with the Garmin nuvi 2599LMT too. Both Google Play and the iTunes App Store have a free app called Garmin Smartphone Link. After pairing the nuvi 2599LMT with the smartphone through Bluetooth, you can use the app to send locations, addresses and contacts wirelessly to the GPS device. Your smartphone can also tether your Internet connection to the GPS device opening up the ability to share parking and other destination information as well as real-time access to weather. This is all powered by Garmin Live Services, which also includes premium services like traffic cameras and advanced weather radars although they come at an extra cost. If you have a more basic phone with Bluetooth, you can still use the Garmin nuvi 2599LMT as a hands-free device since it has both a built-in speaker and microphone to allow safe conversations while driving. The interface takes the form of a sidebar so you can still see the map while taking calls. The nuvi 2599LMT also has a preinstalled Foursquare app that lets your device tap into Foursquare’s massive database of locations and it works offline. It functions the same way as the smartphone app making it a great extra feature if you need to know the most popular restaurants, hotels and other places worth checking out. It is also possible to use your phone’s data connection to log into your Foursquare account so you can use Foursquare’s “Check In” feature too. All of the powerful premium extras found on the Garmin nuvi 2599LMTHD are layered on top of other great features you won’t find on non-Garmin products. This includes Garmin Real Directions and Direct Access, both of which make navigation more pleasant and Garmin’s widely praised Active Lane Guidance with Bird’s Eye and photoReal junction views. Priced at $269.99, you really get what you pay for. There is simply so much you can do with this 5-inch GPS navigator, especially if you use Smartphone Link.